The profile’s data looks at average SAT scores, cost of attendance, graduation and retention rates, financial aid and debt and median post-grad earnings for thousands of colleges across the nation. President Barack Obama announced plans to create this government site in 2013 to track college performances across the nation and serve as an information center for prospective college students. NU’s median post-graduation salary for students receiving federal financial aid is the highest among Big Ten schools. The University of Maryland trails with the second-highest post-graduation salary for that student demographic at $59,100. Similar students at the University of Michigan receive the third-highest median post-graduation salary a decade after school at $57,900. NU also has a higher graduation rate and post-graduation salary among students who received federal aid than its geographically closest competitor, the University of Chicago, which has a median post-graduation salary of $62,800. However, NU lags behind some Ivy League institutions such as Harvard University, Cornell University and the University of Pennsylvania, which all have median post-graduation salaries above $70,000 ten years after graduation for students who received federal financial aid. Northwestern Career Advancement and Medill Career Services administrators said the “College Scorecard” profile does not fully capture the value of an NU education because it fails to explore the different schools in the University and their respective median post-graduation salaries. He said a lower salary shouldn’t discourage students from wanting to work in fields such as the nonprofit industry, but rather they should understand what salaries are available after graduation. Presnell emphasized NCA’s role in helping students choose their career path and said out of the 80 percent of the class of 2014 who responded to a post-graduation survey, only 2 percent were unable to find a job within six months of graduation. “That speaks to the strengths of Northwestern,” he said. Jerry Donahue, assistant director of Medill Career Services, said it would be more accurate to look at specific schools within universities across the United States to find a better estimate of post-graduation salaries. He said a study of journalism schools across the country, for example, would be a better measure of Medill alumni’s financial success. “College Scorecard” only takes a look at the general status of a school and does not reveal the prospective salaries for each discipline. NCA conducted a separate survey of the entire class of 2014, regardless of aid status, and split up earnings between schools. The survey found McCormick graduates earned an average salary of $68,942, followed by Weinberg graduates at $50,331. 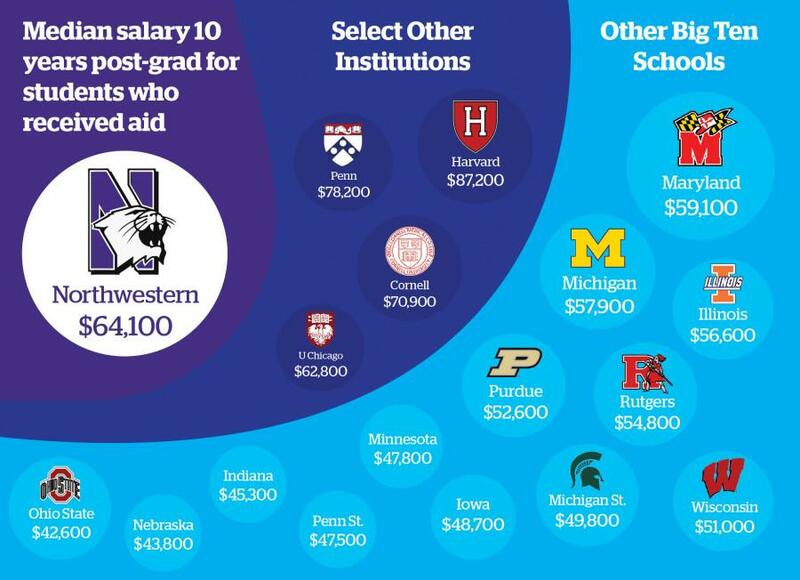 Medill graduates reaped an average salary of $40,347 — the fourth highest-earning NU school. Donahue said he agrees this profile is helpful for parents who want to know what is best for their children, especially given the high costs of a college education. Weinberg junior Erin Dierker said NU has two very different programs for its students that cater to the diverse student population: those who are “business-oriented” and those interested in the liberal arts. Due to this well-roundedness, she said such a ranking does not accurately reflect NU’s value as a leading university. Dierker said she believes there are results more valuable than rankings when considering universities. Presnell said he stays positive about NU students’ outlook post-graduation, saying although the numbers on “College Scoreboard” only reflect the median salaries over 10 years of students who received financial aid while in college, NCA has seen small increments in salaries for NU students across fields.